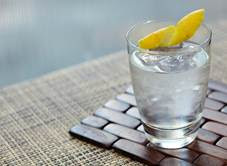 Celebrate Dads and Martinis with Ketel One Vodka! Not only is it Father's Day this Sunday but did you know it is also National Martini Day??? I think that is a great match of holidays! :) I know my husband sure enjoys a good martini! And, it is just another reason to get that hard to buy for Dad a good ‘ol bottle of Ketel One Vodka! You hit two birds with one stone and it’s the perfect way to enjoy the dual holiday in style. Celebrate his hard work with a Ketel One Vodka martini, of course, rich in heritage. From father-to-son for 11 generations, the Nolet Family has embraced an unwavering commitment to excellence in distilling the world’s finest spirits, and 2016 marked the 325th anniversary of the Nolet Family Distillery, the makers of Ketel One Vodka. In 1983, Carl Nolet Sr., 10th Generation, created Ketel One Vodka, a vodka crafted with the perfect martini in mind. They offer three flavors of vodka - classic vodka, Citroen (lemon tasting), and Oranje (orange flavored). I really enjoyed all three but the flavored ones give extra great flavor in a classic martini or mixed drink! In honor of this joint holiday, Ketel One Vodka serves up a classic recipe for the Ketel One Ultimate Martini. Check out the recipe for the Ketel One Ultimate Martini below! Simple and refreshing, the Ketel One Ultimate Martini highlights the base vodka liquid bartenders worldwide have come to know and love since its introduction to the market in 1983. Lightly combined with ice to chill, stir your cocktail before straining over a rocks glass and garnish with your choice of Olive brine or lemon twist. Sure, you could just pick Dad up another tie or “World’s Best Dad” coffee mug for Father's Day this year – he probably wouldn’t make a fuss. But why not get him something that he’ll truly use and appreciate this year? He helped become the person you are today. You owe the guy; get him something that he’ll really love – Ketel One Vodka. You can purchase Ketel One Vodka at a local spirits retailer near you.